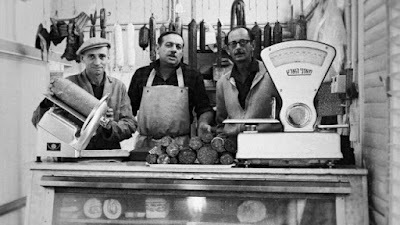 Portrait of the pork market in Israel. If that sounds odd it is because pork is not kosher, however an entire industry exists to provide pork to those who don't keep kosher or who aren't Jewish. A very good and very breezy film looking at the battle of dietary religous laws and the human love of pork products. Excellent short documentary on the life and times of one building in Tel Aviv and how what happened there mirrored what was going on in the city and the country during the same period of time. Hands down one of the best films at the New York Jewish Film Festival and one of the first great films you'll see in 2018. Both films play tomorrow at the New York Jewish FIlm Festival. For more information and tickets go here.